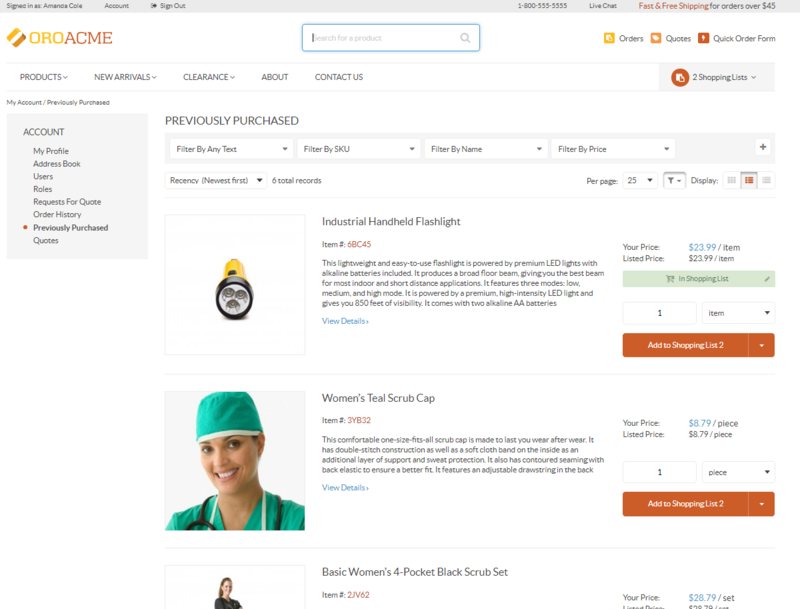 The Previously Purchased Products page displays the products that were recently purchased by customer users. In the storefront, this page is nested under the Previous Purchased section of the Account menu. The Previously Purchased section of the storefront can be enabled or disabled by the website administrator depending on the business and website requirements. View all your previously purchased products and their price. Provide product quantity, add products to the shopping list(s) and create a new shopping list. Filter products by text, name, SKU, price, and other attributes related to the products displayed on this page. Sort them by name, SKU, recency, price, and other product attributes. By default, previously purchased products are sorted by recency with the newest items displayed first.